It was just another snowy day in Manhattan. 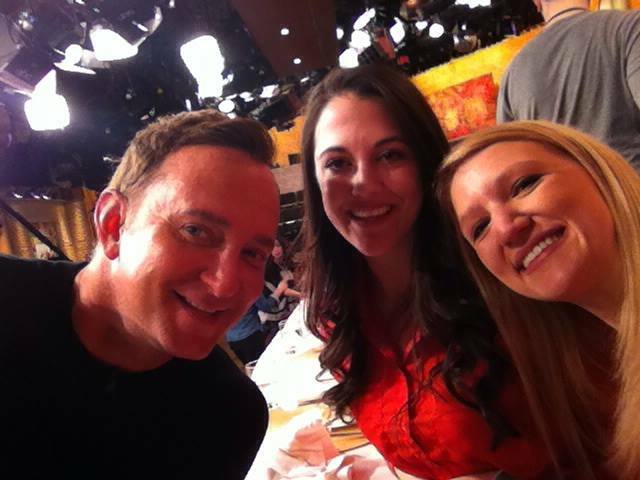 My friend Julie and I decided it was the perfect day to be audience members on a daytime talk show, The Chew. I mean, what else is there to do when a blizzard hits town? We broke out the jewel-tone attire that is a requirement for these adventures. Red? Check. Blizzard-sturdy shoes? Check. We were ready to go. Upon arrival at the ABC studios, we snagged our tickets and chugged our coffee before entering the field that was full of production teams and people looking for snazzy, fun audience members. Julie and I must have had a light shining down on us, because lo’ and behold, practically every person in the studio asked us to keep in contact to be on the show another time (as audience members, participants for activities, etc.). We were stoked! Lucky for us we were able to partake as taste testers— yum! Not only were we taste testers, we were chosen to be participants in a trivia-pie throwing game. We had to answer 3 pie trivia questions. For each correct answer we could step forward to get closer to Chef Michael Symon, our pie target. I lucked out and got all 3 correct—giving me perfect aim for the $250 prize I won! The studio team was so kind—we had no idea that this snow-filled day would end up with us on TV, tasting some seriously amazing food, and winning a cash prize. Who knew?! As if that wasn’t fun and exciting enough, Clinton Kelly (a hero of mine!) chatted and took a selfie with me and Julie. Isn’t NYC amazing? The Chew episode we’re on will be airing on March 28th. Spot us in the crowd and watch our pie throwing skills!